Gallup says today that doctor-assisted suicide is the “most controversial cultural issue” in its recent poll. Why? Because it’s the issue where opinion is divided most closely. I’m not sure that’s really much of a proxy for “most controversial,” but I guess it’s their poll, not mine. What struck me about their list, though, was how few of these things I object to. Out of 17 issues, there were only four I objected to, and even there my objections depend on circumstances. 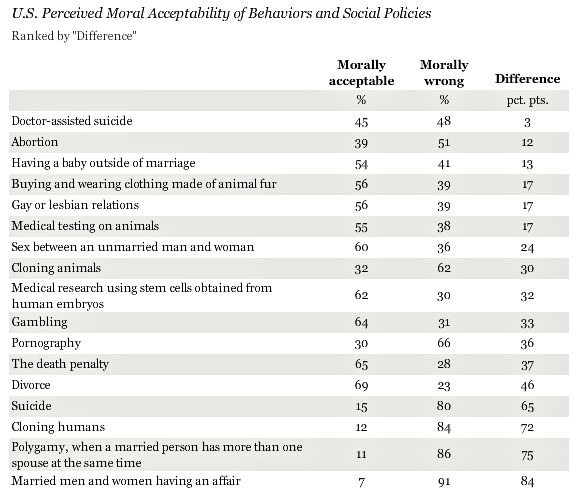 There really wasn’t a single one that I just flatly, always think is morally unacceptable. I’m not sure what this says about me.